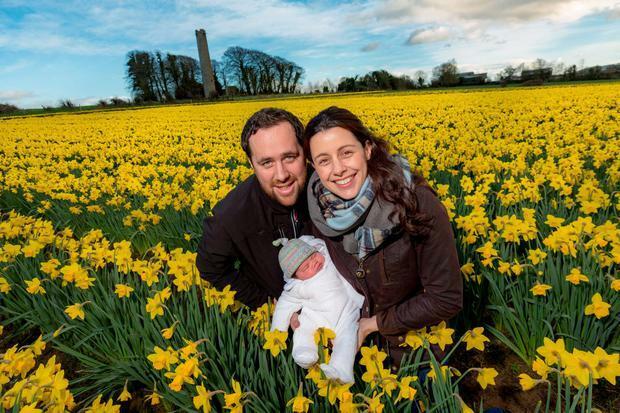 Daffodil farmer Julian Hughes is celebrating a roller coaster few weeks after being given the all-clear from cancer and welcoming the birth of his daughter Robyn. Julian (31), who farms about 400 acres in Kilkenny, was diagnosed with testicular cancer last May. Three days before he was due to have a two-and- a-half centimetre growth removed, his wife Valerie discovered she was pregnant with their first child. He underwent intensive chemotherapy at St Vincent’s Hospital in Dublin, losing his hair and eyebrows as side-effects. “I looked like a lump of moulded putty,” he joked. “Valerie carried a lot of the stress for me during that time. Julian was mindful testicular cancer has a very high cure rate. “It really makes a difference if you adopt an attitude of putting out your chest, being proactive, positive and I would say almost aggressive in how you approach the disease,” he said. He got the good news that the cancer was gone five weeks ago after he went for his final scan. The young couple’s joy was complete two weeks ago when Robyn was born. Julian advised others with potential symptoms not to delay getting checked. To support Daffodil Day call 1850 60 60 60 or text DAFF to 50300 to donate €4 to the campaign. Donations can be made online at www.cancer.ie or you can download the Daffodil Day app from app stores in Ireland.